Bandit’s been working with (not really for) Reynolds since chapter 42. But how will she take the news that she is also working with and/or for Byron? I’m not sure I’d really say she’s working “with” Byron. That smugness is perfect. He went from being bumbling and naive to being underhanded. Guessing that Bandit isn’t as mad at Byron as we thought. Just a game to make it look like they aren’t working together. While lies are the more available tool for manipulation, the truth is far more potent a weapon for those who are proficient in the use of it. I think she’d be furious if she knew she was being played regardless of the cause. This might not be Byron’s doing, but simply looking the other way while Dean Reynolds assigns Bandit to these raids. Welcome to politics! Where people in chairs take advantage of the actual doings of the people. I mean we are all just people, after all, with causes. Thanks for working in my favor. Aw man, look at those adorable troll builders, they’re all so cute! The Don’s being short-sighted. A liberated slave can still be a source of cheap labor, and has the additional benefit of being a potential customer. You do not have to feed them, host them or cure them. You do not have to forcefully breed them, as they will thrive on their own. You do not have to micromanage them, as they can be self sufficient. They may even become more loyal then when they were enslaved. This is exactly like my fish-tank. I provide the tall long grass for the spawn, but nothing ever comes of it. The cost of maintaining the population is pretty higher. It would be so much easier if they just reproduced like I want them too. It goes deeper than that. A slave’s primary motivation is to work just hard enough to keep being fed and avoid being beaten. A free worker’s primary motivation is to earn the biggest profit per unit of work, which encourages them to innovate and to gravitate toward the areas of the economy where their skills are the most in demand. If the goblins keep their slaves Don can ensure that he will remain the wealthiest person in the local economy. If he frees them he loses that guarantee, but the way unfettered economies tend to grow exponentially means that as long as he doesn’t completely mess up his personal business he’ll end up far wealthier as the employer of free orcs than he ever could have as a slaveowner. So he needs to decide what’s really important to him: The social prestige of being the wealthiest goblin? Or actually having wealth beyond his ancestors’ wildest dreams? And thus began the age later known as the Jim Don era. what is this, right here? Is it a haiku contest? 3-5-3 is a legitimate alternate format. Of course, it doesn’t really count unless the syllables are Japanese. I admit I don’t understand how a single member of this council is holding up what the rest of the council seems to agree on, or at least a majority, but cool that they insist they let the slaves be slaves and only free a few at a time? It could just be that they have a weak central government, where member races really have little power over the laws in the territories of the others. So slavery could be illegal in the former Gastonian capital but still be legal in Goblin cities. Sort of analogous to the situation where some States prior to the Civil War kept slaves and others didn’t. 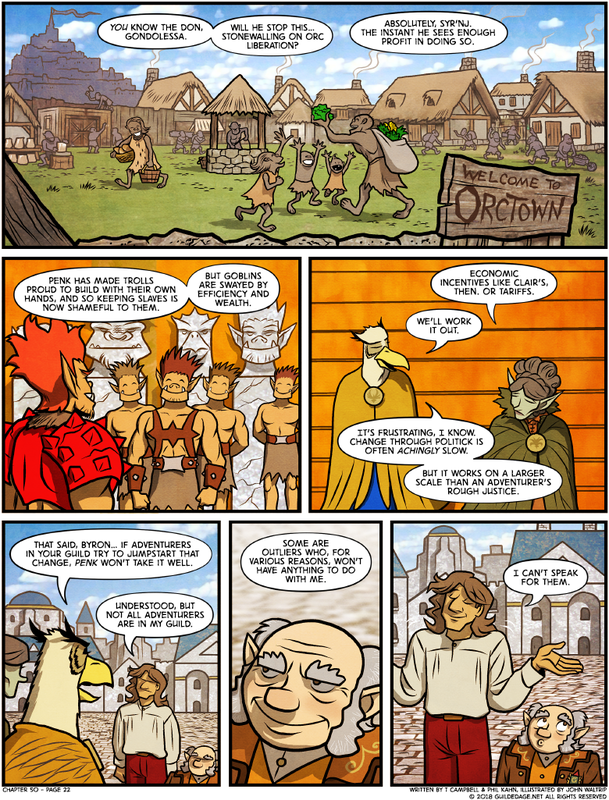 Don mentions that Gobbos bought a bunch of slaves from the trolls, who likely sold them all off shortly before it became illegal to own them in Troll society. Either that or this actually *isn’t* a central government yet. It’s just round-table negotiations and nobody has votes yet. In which case, Don has a lot of say in these matters because he’s representative of the industrial and financial arm of the World’s Rebellion and technically the sovereign of the Goblins, who likely have their own undespoiled cities. So you have a situation in which Don has too much invested here that he won’t walk away from the table, but won’t knuckle under to agreements or treaties which you have no power to enforce over him. He’s also owed a lot of money, so he’s got quite a bit of leverage here. My understanding is that it’s mostly Goblins still keeping Orc slaves, so swaying the Don would be the way to convince the Goblins. Troll might be convinced that doing the job by themself (not relying on the orc) is a sign of being powerful. Please let Bandit and Byron have made up. It’s killing me to see old friends hating each other! Just so I understand, the “working class adventurer” goes on a series of quests, gets hitched, finds out their entire world is a lie, takes down literal viruses to the game in which they live, stops a mad programmer, and becomes leader of their race? XD. Well, more of a CEO than a programmer but he personally adds stuff to the game so it’s the same sentiment. Whaddyaknow, the orcs can build their own villages and have rich social lives. Color me unsurprised. How many generations until they get a seat in the council? Like three or four generations, but then said Orc council member will get accused of being born in Cyberia and a member of the Countless cult and their replacement will be another Goblin who definitely has Orctown’s best interests at heart. I dunno, happy orc children begging for lettuces is … well … odd. Nice, but odd. Begging? Looks more like they’re playing around, and/or welcoming back their dad. I have never seen anyone as happy and excited to see a lettuce as that orc girl! So far we had greedy grinning, diabolic grinning, work-well-done-grinning, we-are-free-now-grinning, generic-happyness-grinning…gah…I’m not sure if I can take much more of it. As a gnome, Reynolds has a genetic imperative to whistle nonchalantly whenever someone issues a denial.